READY NOW!!! Coastal style villa. Two bedroom, two bath, two car garage, flowing floor plan with popular Ventura Plank 7 x 22 tile flooring in all main living areas, hardwoods in the study and carpet in the bedrooms. Kitchen offers stainless steel appliances, 42" upper cabinets, Sonoma style painted Linen with Marble Mist Zodiaq counter tops. Dining room located right across from the kitchen. Owner's Suite features tray ceilings with large Master Bath offering dual sinks, large shower with seat, massive walk in closet. Secondary bedroom and bath are located in the front of the house, great for privacy when you have guest or a child at home. Great room features large sliders that you can open up to the screened in lanai, over looking the preserve area out back. Upgrades include a Ecobee 4Smart thermostat, USB port outlet in Owner's Suite and Kitchen, pre wiring for ceiling fans in certain rooms and more! 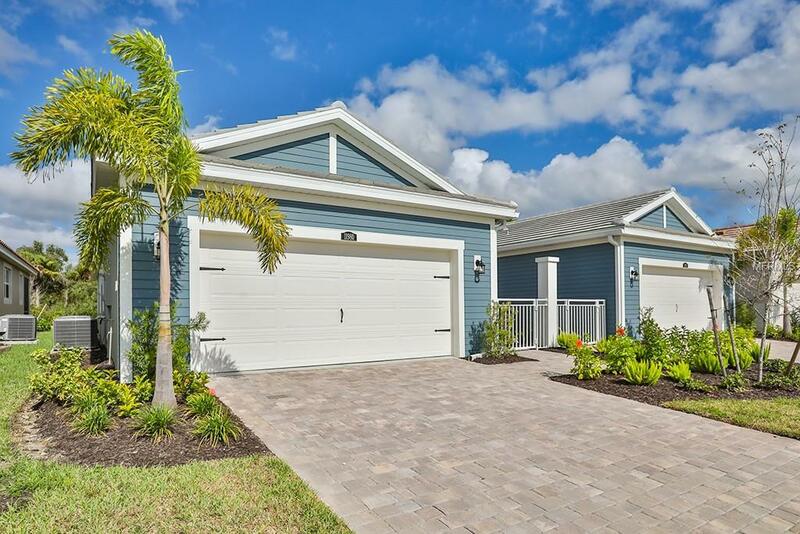 Located in a gated community with clubhouse, pool, tennis courts, pickle and bocce ball and more! Close proximity to golf, beaches and shopping. Make an appointment to see today.